Android was initially developed by Android Inc. but after being financially backed up by Google, in 2005 Google bought Android. HTC Dream was the first Android running smartphone released on October 22, 2008. According to a survey almost 71% of developers use Android platform. Android also tops with having the most number of apps in its Google Play store which are almost 1 million and almost 50 billion downloads and counting. 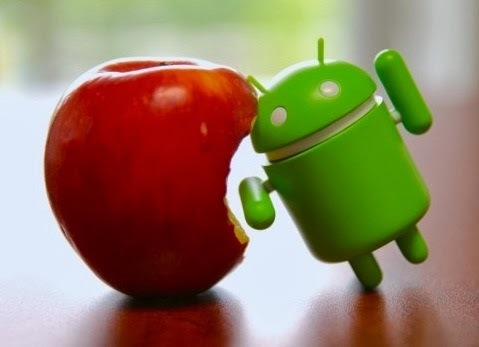 Why to Choose Android Over iOS? Android is the most popular mobile OS as a recent survey showing its activation on almost 1 billion devices worldwide. Because Android is a very popular operating system worldwide it has a very good security system. Popular security firms such as Avast, AVG technologies and McAfee have their antivirus softwares for all android devices. But because android applications run in sandbox so the antivirus cannot scan in deeper system for threats. Google publishes its own code under Apache License 2.0 which makes Android a free and open source software. iOS is an operating system developed by Apple Inc. iOS was first released in 2007 for iPhone but now it supports all Apple devices including iPad, iPod Touch and Apple TV. According to a survey Apple’s App Store has approximately 1 million apps in which almost 500000 are optimized only for iPad. Collectively these apps have been downloaded almost 60 billion times. Almost more than 410 million devices have iOS installed in them behind Google’s Android making its share of 21% in market. Why to Choose iOS Over Android? Siri is an important feature in iOS devices. According to user’s spoken commands, Siri can perform variety of tasks such as to text or call someone, open the web, open any application etc. Game center is also an interesting feature in iOS supported devices which is an online multiplayer. It allows users to invite friends to play online, share their scores etc. Jailbreaking has always been an issue in iOS since its release which allows users to download paid apps for free, installing custom themes and even installing different operating systems in Apple products. iOS has always been subjected to a number of hacks. In conclusion of Android vs. iOS, one can say that both are very good operating systems. It depends on user demand that what type of operating system he wants. However both rival operating systems need some improvements for their better functioning.